Between Guangzhou and Kunming, a lot can change. The plan, insofar as I had one, was to backpack from Hong Kong to Guangzhou, before catching a train across China’s southern crescent to Kunming, the rail-to-bus nexus nearest my final destination, Lijiang. Located in Yunnan province, Lijiang’s mountainous terrain and proximity to Tibet make it a popular base from which Western hippies and other wanderers hike and soul-search. From there I was headed twenty miles north to the Tiger Leaping Gorge, where the Jinsha River plows through a pair of soaring rock faces at the base of 13,000-foot mountains. But Lijiang was a long way from Guangzhou, the rail hub in southeastern China where I landed on the seventh day of my journey. The air, stew-thick and oppressively hot, left grit in my mouth. Purchasing a train ticket alone had tied me up for hours, so I nearly fainted from relief when the clerk said, “Guangzhou-Kunming. Tomorrow, foh o-clock pea-hem. You take train twenty-five hours.” The next afternoon, I boarded the train. There were four beds in my compartment. My bunkmates looked to be a family of three, two young parents and a little girl, each of them wearing identical pink knock-off Polo shirts with an embroidered, almost-accurate logo as big as a man’s hand. Across from them, a man of about 60 and his grown son, who shared the older man’s kind face, slumped on the metal window bars, watching Guangdong province glide past. A moment later I saw them slip into the compartment next to mine. Honestly, I had little desire to make the acquaintance of my neighbors. The couple, as if trying to impress the American in their midst, muttered snatches of English to their daughter, but it was broken, limited, hard to tease out. The language barrier, I reckoned, confined me to an excusable solitude. After all, I hadn’t come to China for the people; I had come for the experience. China was discomfort, confusion, mystery, and insularity. I was depending on China to explode my habits, to dismantle the complacency brought on by workweek-weekend, workweek-weekend routine. I wanted to go there, I told my friends before leaving Washington, just to see if I could do it. I went to bed early that night. There was nothing to see; the father-son duo was hogging the window again. The logistical stress and the whole Guangzhou episode had left me sapped. The train rumbled on. The light from outside began to fade. Before closing my eyes, I noticed across the way the little girl curled up in her mother’s arms. She was already sleeping. When I awoke the next morning, the window was clear. After blinking my contact lenses into place and a breakfast bowl of instant noodles, I shuffled over in time to watch a range of low mountains blip by. Every natural feature, even a little lake near a clutch of forested hills, shone in an intense mid-summer green. By now I figured we were on the other side of Nanning, the largest city between Guangzhou and Kunming. My guidebook called Nanning a “hard city to really love.” I didn’t regret having slept past it. I began to wonder about finding a place to stay at the end of the line. The train had made several mid-track stops; I calculated roughly two hours of lost time. That would put us at the platform around 7:00 pm—later than my arrival in Guangzhou, and with no better resources for finding room and board. I acted against a creeping sense of worry as best I could, which meant simply circling Kunming hotel listings in my guidebook. Phoneless, I could do nothing else from the train. After a lunch of grisly pork and watery beer in the club car I returned to my bunk and cracked open Paul Theroux’s classic Chinese travelogue, “Riding the Iron Rooster,” only to glance up and see the grown son of the father-son pair perched on the bunk opposite mine. The man was staring at me, smiling. “Nie hao!” he nearly shouted. “Both, I guess,” I replied. I told them I was headed to Lijiang to hike. To illustrate the idea I pumped my arms like a power walker. “Ohh,” the son from next door said slowly, then stood up and began to march in place, scanning the horizon, Daniel Boone-style, with a hand shielding imaginary sun from his eyes. He adjusted an invisible pack on his shoulders. “That’s right,” I said and had hardly finished speaking the words before the man swooped down and grabbed a pawful of my calf muscle. “STRONG!” he shouted in English. Everyone laughed, I mean really laughed, those big guttural laughs that conquer whole faces. Gradually, the laughter ceased and everyone withdrew, leaving me, still puzzling over what had just transpired, to stare out the window. The land outside had changed; the tropical greenness had been replaced by darker, deciduous forest. I still didn’t know where I was going to crash in Kunming or how I was going to get to Lijiang. When an attendant passed I asked her, via the young father, if she knew how much time was left before we arrived. 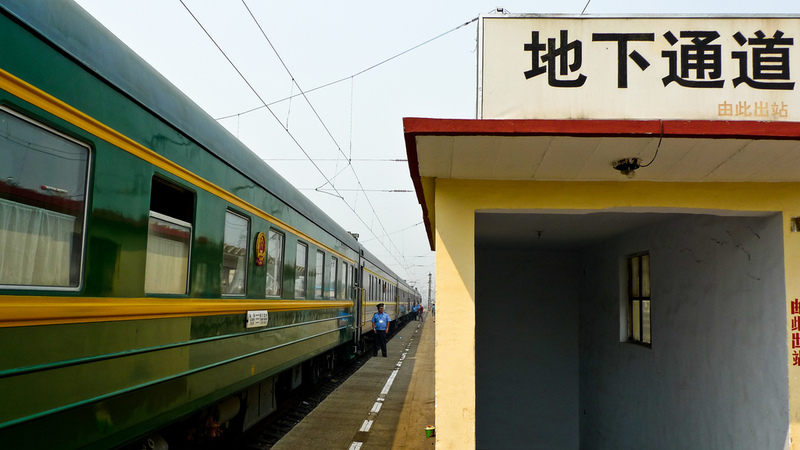 “She say, ‘Maybe two hours—maybe much more.’ Chinese train,” he translated. Apparently, that explained everything. When I stepped off the train later that night it was after 9:30 p.m. The 25-hour haul estimated by the Guangzhou ticket clerk had stretched to more like 30. Train exhaust and humid air swirled around me. The sun was down and it was nearly 90 degrees. The young man from the next compartment over was standing near me. All at once, something like regret swept over me and with the same fierceness with which he had palmed my calf that morning, I grabbed his hand and shook it. Despite my standoffishness, he had taken intense interest in my trip. He had wanted to connect even if only through an interpreter. I snapped a picture of him. Later I realized I never got his name. At the cavernous entrance of the train station, there was a giant map of Kunming. Stressed but concentrating, I flipped to the circled hotel listings in my guidebook. Just then I heard my bunkmate speak an inquisitive word to his wife. She smiled and the husband turned to me. “You need hotel?” he said. His English was better than I remembered. I blinked again, incredulous, and fighting back a dopey grin, agreed. As much as I hated to admit it, the passengers I met on the Guangzhou-Kunming line had called my bluff. In the heart of southern China, where I had anticipated circumspection and mistrust, I found only curiosity, warmth, and kindness. In a word, I had been shamed, and I felt as if I had been given new faith in the human potential for small, practical acts of goodness. The husband, wife, daughter, and I plodded, heavy-laden, into the fray of the city. Kunming’s taxis, mule-drawn carts, pedicabs, and pedestrian hordes surged in a tangled ball of ten million crossed paths, not one of them more fortuitous than mine. Will Fleeson is a press officer at the French Embassy in Washington, DC.